We were running low on gas while driving around Clarksdale, Mississippi so as the truck was getting its fill at a station I notice a Burger Joint across the street. We (my wife Marcela & I) had just eaten a real hefty lunch so I need to store this spot in my Burger memory banks. I went light on breakfast (Bagel & Coffee) the following morning since I knew it was Owens Burger Shack for lunch day. I was very excited as Owens Burger Shack has the look of something that’s going to be great. There are no seats and once you walk in there’s a tight space that might fit 2 or 3 people and an order window. I read and re-read the menu and the pressure’s on when I’m asked what I want to order. So we gotta start with the Hot Wings, Juke Joint Fries, Chopped BBQ Sandwich, and a Chili Cheese Burger. I also try to get the Hot Tamales but they’re out. I’m the only there so I ask about the business. The two fellas mention this is a family owned business and that they are brothers. My eyes light up as this is what I like to hear. I tell them I’m in town from Miami as I’m leaving with the food, that I had spotted them from across the street the day before and they thank me for coming back to try them out. So we’re sitting in the car and we’re looking at everything. It all smells so good. The Hot Wings were first with a flavorful Buffalo Sauce they were soaking in. You also gotta love the piece of bread in the corner used to sop up the hot sauce juices for later. Again, the Fries here are slightly undercooked (apparently it’s a Southern thing) but those toppings make me forget all about it. Jalapeños, Cheese and that dense smoky BBQ Sauce makes these Juke Joint Fries incredible and make me think these would be a great topping for an all beef Hot Dog. Everywhere you look in the South you’re going to find Slaw so it’s no surprise to find it on the Chopped BBQ Sandwich. Much like those phenomenal Fries I just had this sandwich is a sloppy winner but a winner nonetheless. We’re now down to the Chili Cheese Burger which is looking back at me with a scared look. It should have one. I skipped the Slaw on this one but it does have the Chili, Cheese, Onions, and Mustard. It’s a beautiful hand formed patty cooked right on til’ juicy. I probably should have started with the Chili Cheese Burger cause *I’m feeling a bit full at this point. Marcela puts the car on the drive and as we begin to move we see the kitchen door of Owens Burger Shack open up and out comes the gentleman I was talking to at the window. They wanted us to try some of their Rib Tips which are only available on Fridays and Saturdays. These little guys are marinating in that addictive BBQ sauce. I’m one piece in when I realize it’s better I stop now before my Food Coma hits epic proportions. I didn’t need dessert, those Tips filled its place nicely and happily. 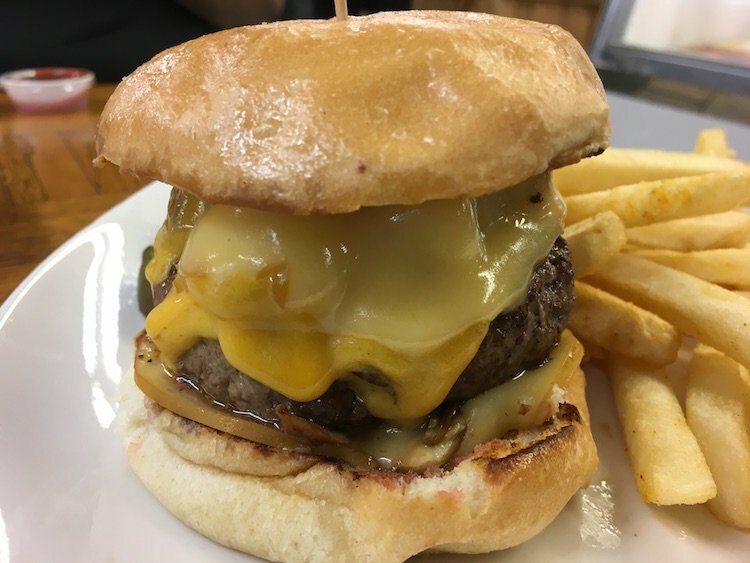 I’m glad we stopped in at Owens Burger Shack, I had a feeling that it would be just what I needed and I was right. *It probably didn’t help that I had two cans of Cola.